Viper Lift Trucks, Inc. has been providing North America and beyond with the highest quality Forklifts and scissor lifts. Specializing in the newest technologies for lift equipment, Viper Lift Trucks can provide an excellent alternative to the high cost of other equipment while keeping quality. Click here to view our selection of Viper equipment for sale. 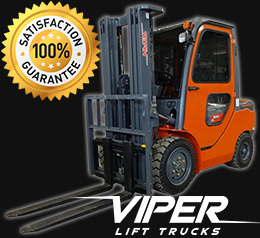 The name of Viper Lift Trucks stands for quality. And this claim is also reflected in the design of our vehicles. Industrial trucks by Viper Lift Trucks whether diesel lift trucks, electric forklift trucks or warehouse handling equipment stand out because of their innovative technology aimed at greater cost-effectiveness in logistics. We provide all types of lifts for all jobs.